Terms and conditions of Snakebusters® Reptile parties ®, Australia's best reptiles® shows. 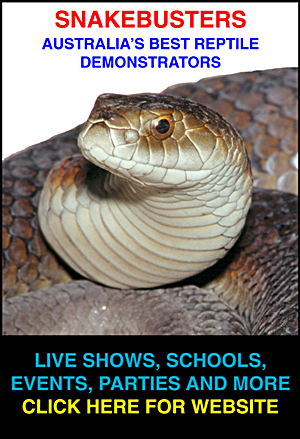 Terms and conditions of Snakebusters®, Australia's best reptiles ® shows, displays, reptile parties®, etc. - We take bookings over the phone, via e-mail, post or fax. - However it is best to confirm by phone. - Unless verbal (phone or in person) confirmation is given, then you may not be certain you have booked us. - Furthermore for all bookings other than childrens parties and emergency snake call outs, we require a written or email confirmation of the booking. - For all bookings we allow a "cooling off" period for cancellations, rescheduling and so on of one week (7 days). - Outside of the "cooling off" period (above) for all other cancellations we reserve the right to charge a cancellation fee, chargeable at our discretion and binding on the person or entity who cancel of the amount as per the schedule below (see "cancellation fees" below). - Pre event promotion (for those who have already booked us) - click here for assistance. - School incursion bookings, study sheets can be found clicking here and student incursion payment forms can be found clicking here. - We accept payment by Mastercard, Visa, Amex and Diners, with a 10% loading to cover administration and processing costs. - Payment for our shows is due within one calender month of the show, or if a series of shows is done, within one calender month of the last show of that calender year. - We reserve the right to take all forms of legal actions to recover debts. - After 60 days of booking, if payment is not received or readily recoverable (or if we are earlier told we won't be paid), we may send the debt to agents or take legal action (see "debt recoveries" below). - We are one of the few licenced reptile exhibitors in Australia to have paid big bucks to get public liability insurance for live reptiles at our shows. We can fax these details to potential clients if need be. Beware: At least some other reptile show outfits in Australia either do not have public liability insurance and/or have made misleading statements to get their policy and/or are not fully covered in terms of their reptiles. If you book with someone else, we cannot guarantee that you will be covered in event of accident. .....Bites from non-venomous (including "devenomized" or "venomoid") reptiles that may even draw blood, but cause no permanent damage (e.g. Stumpy Tailed Lizards). .....Scratching by claws of lizards, (generally no bleeding). .....Whipping by tails of snakes of lizards (no injuries). .....Defecation by reptiles in terms of soiling clothes or carpets. .....Minor injuries to live reptiles in the event of mishandling or even being dropped. All persons booking us, assume the above risks. - Click here to download an html (webpage) version of our "Risk assessment" (Generic document). - Click here to download a MS Word (Better for printing) version of our "Risk assessment" (Generic document). - Note that it is illegal under Sect 32 of the O H and S Act 2004 to demonstrate dangerously venomous snakes in public in Victoria that have not been surgically devenomized. - A "Risk assessment" should be issued and read BEFORE any booking is made (whether with Snakebusters or anyone else), especially if contemplating taking the risk of bringing snakes with venom glands intact onto a site where members of the public attend. - All venomous snakes shown, handled and displayed will, unless otherwise requested be those which are venomoid, which means that they have had their venom glands surgically removed. This is to protect handler, snakes and public from accidental bites in terms of "worst case" scenario. It is also in the snake's best interests that they be made "non-venomous" if being handled frequently and this reflects in the unrivalled exceptional condition of our regularly exhibited venomous species. - Snakebusters are the only reptile show company in Australia with the expertise to have venomoid snakes and therefore only Snakebusters can offer a completely safe and risk free venomous snake show. - Any other company's venomous snake shows will put you, your friends and your kids at risk of life-threatening venomous snake bite which at best will probably have serious peremenant health issues. There numerous such fatal and near fatal snakebite incidents yearly in Australia involving other snake handlers, but most are not reported by the media. - We are the only reptile show outfit in Australia who do not use sticks, tongs and similar devices to torment venomous snake species for public displays. - Because venomoid snakes only have two functional fangs (teeth), which are also relatively small in size, a bite from one of these snakes inflicts far less skin damage than a bite from a naturally non-venomous snake of similar size, which naturally has many sharp teeth in the mouth (e.g. python). - Please note a number of business competitors have littered the internet with false claims and allegations about venomoid snakes. We have successfully taken action against some, but the nature of the internet makes it logistically not possible to action all false and misleading posts. However in summary these snakes do not regenerate venom and do not suffer pain as a result of the operation. The contrary is true. After many years of being devenomized, none have ever regenerated any venom gland (checked and rigorously tested by several means) or a drop of venom. Our snakes have been certified by a licenced veterinary surgeon as devenmomized on several occasions to the satisfaction of authorities in several states. There have also been since mid 2008, many videos in circulation (including the internet) of the Snake Man Raymond Hoser forcing venomoids, including of the world's deadliest species, to bite him to prove that their bites have no venom and are totally safe and harmless and with the skin pricks, that the snakes still have teeth and fangs. Fortunately, the circulation of these videoes have also stopped most of the ridiculous and malicious claims being made about the venomoids. Click here for a Venomoid devenomized snakes FAQ. Obvious risks non-venomoids - not Snakebusters. - Due to the O H and S Act 2004, most reptile demonstrators do not now deal with venomous species. - However, as a relevant note, all our competitors (using venomous reptile species) and/or their staff have been rushed to hospitals for serious venomous snakebites, including no less than 6 serious snakebite incidents in 2007 (and others in 2008-2012, including several fatal bites incurred during displays, with no less than 6 well known snake handlers being killed by their snakes in 2011 alone!). - Snakebusters has a perfect safety record (no staff ever rushed to hospital for snakebites) and with venomoids there is zero risk of such ever occuring at a show or event. - We accept no liability or responsibility in terms of persons who may see one of our shows and any actions they may take afterwards. - This includes attempts by show participants or viewers to move, handle or catch other wild or captive reptiles, snakebites and other potential mishaps, physical or legal. - Snakebusters and no one else, can guarantee safety of person/s at a reptile demonstration using venomous snakes that have not been surgically devenomized and issues a warning to this effect. Claims of "expertise" by handlers in terms of public events should be dismissed, noting that even the best handlers may get bitten when handling deadly snakes and on a regular basis such bites occur. - Note that in early 2008, an experienced reptile demonstrator died from a snakebite from one of his "pet" snakes that had not been devenomized. Also note that sometime earlier in a separate incident, thieves stole a deadly snake from within a locked room at an exhibition. That snake was not devenomized and had a bite occurred, the owner of the snake would have been liable to be sued. - Recent life threatening snakebites (usually needing anti-venom to save the life), involving licenced demonstrators and staff (from outfits who at times compete against Snakebusters for business) who do not use venomoids, have included the following: Simon Watharow (trading as "Snakehandler"), (rushed to hospital and needed anti-venom (AV) after a Tiger Snake bite), Sean McCarthy also trading as "snakehandler", who uses tongs to attack snakes and was recently carted to hospital for a Death Adder bite, John Deutscher (who worked with Watharow), a number of Death Adder bites and anti-venom and now no longer keeps snakes for obvious reasons, Glen Clapton at Healesville Sanctuary needed AV after getting chomped by a Red-bellied Black Snake, Byron Manning also at Healesville Sanctuary was similarly chomped by a Broad-headed Snake and rushed to hospital for a dose of anti-venom, Stuart Parker of Ballarat Wildlife Park was rushed to hospital in 2007 after a Death Adder bite, Chris Hay, carted off to hospital for serious bites a number of times, including bites from a King Brown and a Floodplain Death Adder, Neville Burns, chomped by a Black Snake, carted off to hospital and missing a finger from same, John Lucas of Educational Reptile Displays, was rushed to hospital in 2007 after being bitten by a Mulga snake when showing it to people at the Redlands Show and again shortly after by a Death Adder when showing people how "squishy" it's head was and the snake not surprisingly taking umbrage at the cruelty inflicted on it, Tom Parkin of a North Queensland wildlife park rushed to hospital after a Taipan bite in 2007, add to the list keepers at Australia Zoo (Queensland)(Taipan bite), no less than four near fatal bites in a decade and that's before one includes non-snakebite incidents such as Steve Irwin killed when illegally attacking a Stingray in 2006 and countless serious big cat attacks at the same place, Australian Wonderland (Sydney)(Jaffa snake bite, later had one stolen), Venom Supplies (South Australia) (at least four near fatal snakebites and a fatality involving a staff member), Bredl's Zoo (South Australia)(Taipan bite), Tony Harrison of the Gold Coast Queensland, who besides having several near fatal snake bites himself requiring rushed trips to hospital and anti-venom, he also nearly killed a member of the public after a venomous snake he illegally gave him bit him and nearly killed him, but he was not charged over the incident as he is well connected; and it is clear that use of non-venomoids is hazardous for all concerned. Worksafe Victoria have already stated (in March 2006) that non-venomoid snakes cannot legally be used in Victoria under the newly passed OH and S Act. - Click the following link for a more extensive and up to date list of fatal and near fatal bites of snake handlers. - Based on the Worksafe statement/s and the O H and S Act, venomous species shown outside a Snakebusters demonstration, or outside a locked and sealed cage in a zoo, are probably being shown illegally and if an accident occurs, both demonstrator and booking entity would probably be liable. In VCAT in 2015, Melbourne Zoo staff confirmed they had legal advice that use of snakes with venom for displays, even if in cages in a public display in a zoo is illegal if there is any way, shape or means that a determined person could break into the facility or cage and steal the animal and get bitten at the same time. - All information and advice we give is given in good faith and based on decades of experience. It may not however be either correct and/or applicable to all circumstances and we accept no liability, legal or implied in terms of persons following our advice or any liability if people choose to deal with unsafe providers. Warning: Reptiles are highly regulated in all Australian states. - In most cases it is illegal to catch, keep, handle or interfere with any reptiles in any circumstances without written legal authority from the government. - Due to the complexity of the laws and the frequency with which they change, any advice we give on such matters must only be regarded as 'tentative' at best. - Persons intending having any contact with reptiles (in any way) outside of a snakebusters presentation should in the first instance seek binding legal advice from the relevant government authorities. Reptile and wildlife removals including "call outs". - Any booking cancelled after the seven day "cooling off" period is subject to a cancellation fee at our discretion. Under normal circumstances, this will be half the normal fee payable, which we levy to cover potentially missed bookings. - For any cancellation within 2 days of the scheduled event, including if we arrive at an event when a cancellation has not been communicated to us, we shall charge the full booking rate, regardless of whether we actually do a display or not. - Notwithstanding the preceding, we reserve the right to charge a cancellation fee of double the full amount we would have been paid, for any event that has cancelled and subsequently engaged another company or entity in any form of reptile or wildlife display at the event, even if we used our discretion not to levy a cancellation fee at the time we were advised of the cancellation (such as outside the 7 day cooling off period). The fee of double is payable to cover both the lost income from other potential bookings and any damage to our brands as a potential result of the use of our Intellectual Property (IP) and/or superior reputation in the promotion of the event at any stage. In addition, we also explicity reserve any and all other rights in terms of our intellectual property including to also sue for things like trademark infringement, damages, punitive damages, aggravated damages, corrective orders and anything else legally allowable, should our intellectual property be used by any person at any stage in any way improperly. - Likewise (in terms of the above) in terms of the differential payment chargeable in the event a cancel fee of 50% or 100% was paid in terms of the same event in the absence of knowledge by us of another company or entity doing a reptile or wildlife display at the said event. - Cancellation fees are payable within 7 days of the cancellation. - We add costs payable for unpaid debt recoveries at our discretion. - Any legal costs incurred during debt recovery are added to the amount payable either at the time or if need be after this as a "new debt owed". - Any matter referred to the "Small Claims tribunal" Victoria or equivalent, shall have an added fee of $1,500 a day (or part thereof) added to the claim to cover potentially lost bookings due to potential time spent in court, lodging papers and the like and time spent at the tribunal, with an added 50 per cent loading on the original debt added as well. - In other words any debt claim lodged at the "Small claims tribunal" or equivalent will be for an owed amount of at least $1,500 and 150 per cent of the booking or cancellation fee payable and owing. - As a warning, Snakebusters has in the past successfully actioned entities and persons who have cancelled and/or not paid in bad faith for the full debt owed and/or unlawfully used our intellectual property! - Please also note that there have been fatal snakebite incidents involving our clients or potential clients who have been unlawfully diverted from our business to unsafe inexperienced imitators and nothing here removes that risk to those who deal with these persons and entities. - Snakebusters are not to be held responsible for the general conduct of persons at a venue or event and have no responsibility or liability for damages, thefts and other actions by such persons either of snakebusters materials or that owned and/or controlled by others. - Snakebusters and all staff will at all times put the welfare of their animals first. This may involve altering or at "worst case" stopping presentations if it is determined that there is an unacceptable risk to any animals in any way. This may include "barring" or banning persons who have been determined "high risk" and our decisions in this regard are not subject to negotiation or dispute. - If snakebusters terminate or alter a show in any way as a result of conduct of persons and/or unforseen event or circumstance, Snakebusters will not be liable for any damages or refunds. - Snakebusters only allow photos for private purposes only. Any photos to be taken or used commercially, printed on websites or similar must be approved by snakebusters first. Under no cicumstances are any photos of snakebusters in any manifestation to be digitally altered in any way, except following written approval by snakebusters. 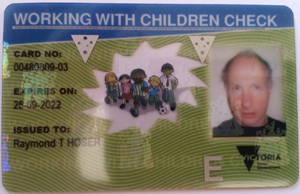 - Photos taken in schools and pre-schools can be used for in house purposes without permission so long as they are not used in any way that may in any conceivable way commercially harm snakebusters or any snakebusters staff. - Snakebusters photos, photos taken of snakebusters reptiles and similar must not be used to promote other persons, other persons reptiles, other events not featuring snakebusters or any other such thing that may cause a non-involved person to be mislead in any way. - Any event that books Snakebusters is allowed to use photos taken of Snakebusters for promotional purposes, as per the rules at: http://www.smuggled.com/kotabi4.htm. - Under no circumstances are our images or images of us and our reptiles, and similar to be used to promote any other wildlife demonstrator, zoo or similar, or entities not controlled by us, including in any possible way, such as at a venue where we have appeared and an alternative animal, reptile or wildlife show may appear subsequently, for the obvious reason that we may be inadvertently associated with the other entity in some way. - In the event that photos of Snakebusters and/or our reptiles are used to promote another wildlife displayer at an event Snakebusters have appeared at, Snakebusters reserves the right to charge for infringed IP, at the rate that would have been charged at the event had Snakebusters attended. - Furthermore, Snakebusters reserves all rights in terms of infringed IP, especially in the face of continued infractions or those following any "cease and desist" demand and in the light of deliberate and serious IP breaches by less experienced reptile handlers in the period 2006 to 2012, and persons acting at their behest, not all of which we have actioned. - Snakebusters accept that all equipment, boxes and the like will be subject to normal "wear and tear" and this is not an issue. However in terms of malicious, reckless or unacceptable damage, we seek rights to recover costs. - In the event of theft or malicious or reckless damage to boxes, equipment, banners or any other material, Snakebusters reserves the right to levy recovery costs for "as new" replacement, including associated costs for sourcing, freighting and the like. - In the event of theft of animals, or intentional killing of animals, snakebusters must by law report all such incidents within a reasonable time frame and will do so. - In the event of theft or intentional killing of animals, the venue or booking person/s will be held liable for replacement costs to the following minimum scale, $300 per skink lizard, frog or terrapin, $1,000 per snake, crocodile or non-skink lizard, with a loading of $5,000 for albino's, leucystics, or scaleless reptiles and same for Green Pythons. - Reptiles intentionally or recklessly injured at an event that die as a result (must be within 60 days), will be treated the same as in above paragraphs. - Inductions: For bookings such as photo shoots, publicity events, corporate events, "meet and greets" and similar, we reserve the right to do an "induction" prior to commencement of the scheduled work to ensure an educational element to the booking and to make sure the relevant people are educated properly about reptile welfare, handling and if neccesary safety issues. - Courses: All persons doing venomous snake catching, venomous snake handling or similar courses will be made to sign an indemnity or waiver of claim prior to commencing the course or they shall not be allowed to do the said course. Legal requirements in terms of the course, including species used will vary depending on the jurisdiction and any potential directives (legally binding) by government authorities. Intellectual property, Defamation and similar. - We do not like litigation as it is costly and time consuming and diverts our attention from our world leading conservation work and hence prefer people to simply do their business honestly and ethically. False claims against Raymond Hoser and Snakebusters. - For some years, a number of inexperienced imitators and others who stand to gain from the demise of Raymond Hoser and Snakebusters have waged sophisticated campaigns to attack and discredit our brands with a litany of lies and other attacks. Included have been no less than 36 bogus criminal charges laid by corrupt wildlife officers with an improper relationship to these businesses, all of which were thrown out of court in 2014 (twice) and again in 2015, when they were illegally relitigated. The government regulator which also competes against Snakebusters in the "wildlife business" and itself breaks the law regularly was ordered by Victoria's highest court to pay costs in 2014 and as of 2016 is facing a multi-million dollar payout. © 2016, Snakebusters®, reptile party®, Melbourne, All Rights Reserved.